“Perfect!!! Perfect in every way! Great mixture of sightseeing and golf. The hotels you selected for us were magnificent, especially Channings, Rusacks and Turnberry. If anyone goes to Scotland to play golf and doesn’t stay at least a couple days at Turnberry, they’ve ruined their trip. Beautiful scenery, great golf, and the pipers just added that extra touch. 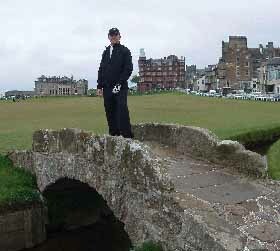 And, of course, the Old Course at St Andrews was inspiring – I’ll relive that round for the rest of my life. Every detail, even the rental car (flawless service) could not have been planned any better. I’ll certainly recommend you to anyone I know thinking of travelling to Scotland. A memory my wife and I will share for the rest of lives – all thanks to your great work!